I’ve mentioned several times that I’m dissatisfied not only with the color of my concrete countertops, but also how they’ve stained over the last two years. I used a sealer recommended by the company that provided the actual concrete and the edge forms, and I wish I had done much more thorough research on concrete sealers before I made that decision. 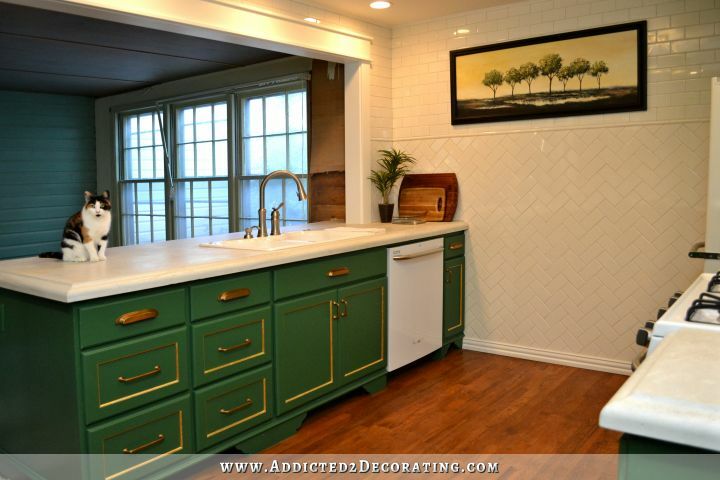 I love the countertops overall. I would choose concrete countertops again, if starting over on my kitchen. They’re incredibly durable. Nothing will scratch concrete. I’ve scraped stuff off of my countertops with the point of a sharp knife, and it won’t damage them. That part I like. I’ve had the most trouble with oils. Those rings are from an oil-based vitamin additive that I add to my dog’s food, and I would just squirt it on his food and then place it on the countertop. The rings weren’t immediately noticeable. They darkened considerably over time, and then it was too late. The damage had been done. After doing quite a bit of research on the best concrete sealer available, I found that Stonelok E3/2K2 is one of the best. In fact, on one site that had tested all of the best sealers for durability, it was rated as the second best. “So why not go with the best?” you might ask. Well, I can’t remember what the most durable sealer was called, but it was only available in a super high gloss finish, and that just won’t do. This Stonelok E3/2K2 comes in three different finishes, including an extra low gloss. Interestingly, about a month after I found this product, Chris and Julia from the blog Chris Loves Julia poured their own concrete countertops using the same company’s concrete and forms that I used (except they used the square forms, and I used the ogee edge form), and then they used the Stonelok sealer. 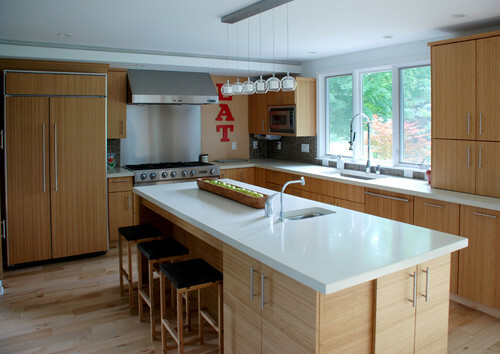 You can see and read about their countertops here. 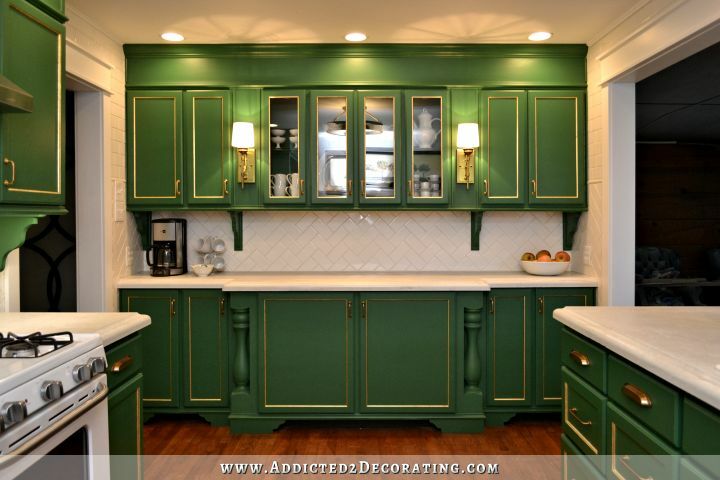 Of course, since then, I’ve talked about staining my countertops black, but that was when I was planning on doing kelly green cabinets. Now that I’ve decided on the dark blue (Benjamin Moore Gentleman’s Gray) for the lower cabinets, black countertops won’t work. So I have to find a way to brighten up these countertops and remove the stains. 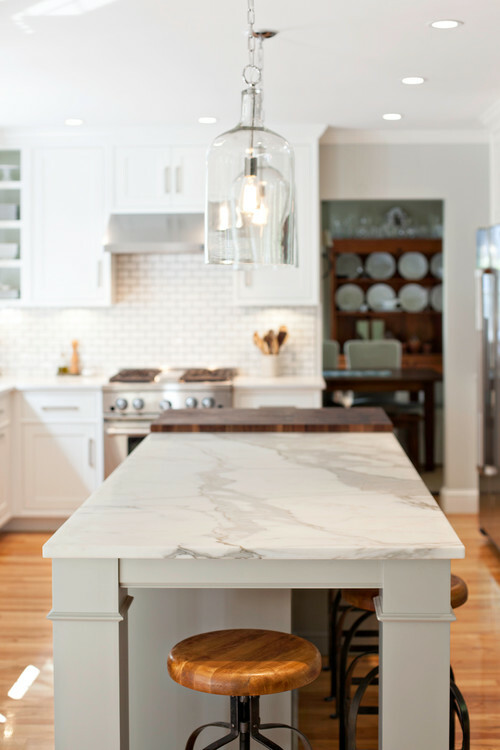 I’ve also been thinking that since marble is my favorite, and for years now I’ve wanted a kitchen with gorgeous carrera or calacatta marble countertops, I might actually try to use various stain colors to mimic the look of veining. And then finally, a big issue I’ve had with my countertops is that there are pitted areas in the surface. That was just from my inexperience with concrete. I had never worked with concrete before pouring my countertops, and I had no idea what to expect. So when it came to floating the concrete, I didn’t get it perfectly smooth in places, and it left some pitted areas. After two years of dealing with those areas, I can assure you that textured/pitted countertops and food/cooking just don’t mix. Stuff gets into those divots and pitted areas and the only way to get it out is with a scrubby brush and elbow grease. And obviously, I’m not going to scrub my countertops down with a scrubby brush every day. That’s way too much trouble. I need something easy. So I’ve looked at and researched how to go about solving all of my issues with these countertops. If I were going with dark countertops, it would be so much easier. I could just strip them, clean them, and stain them with a penetrating stain. Then seal them and be done. But since I’m going lighter, I really don’t think that just using a penetrating sealer will work. It might lighten it up just a tad, but probably not enough for what I want. After looking at all of the stain options, I finally came across this product called Deco-Poz, which is actually a concrete micro-topping that can be used to resurface damaged concrete. And it comes in white. So my plan is to strip, clean, and etch the countertops using products that I found at Home Depot. Then I’ll do a very thin skim coat of Deco-Poz over the surface, which will not only fill in any divets and pitted areas and make them perfectly smooth, but will also give me a brighter white (and probably super porous) concrete surface to work with. And then I’ll stain and try my hand at adding some veining…maybe. Once that’s all done and dry, I’ll seal it with the awesome sealer. And then I’ll hope and pray that the new sealer as good as the reviews say it is. I actually stripped the countertop on the wall of cabinets yesterday, and then left some concrete cleaner/degreaser on it. Once that’s dry, I’ll scrape it up and then clean and etch the countertop today. Hopefully I can get a coat of Deco-Poz on today and show you some progress tomorrow. In other news, cabinet paint is purchased, as is the grasscloth wallpaper for my breakfast room. And the drywall guys came Friday to drywall the hallway, and are coming back to do the taping and mudding. I’ll show you that progress later this week. Since it is concrete could you paint them like marble then seal? If I can’t get any of the penetrating stains to work, then I’ll have to try painting. I’m really hoping a penetrating stain works, though. If you choose to paint them, please consider a “cementitious paint” that will bond with the concrete. I’ve had excellent results using cementitious paint on exterior concrete. No peeling or flaking. Even though you were “out of commission” for a few days with a hurt back, you’ve been making progress! Can’t wait to see the fixed up counters and the hallway ready for work! Yay! One question: is the Gentleman’s Gray going to be a high gloss? I bought it in a satin finish. ABSOLUTELY LOVE the color, Kristi. And I’m a red/orange/olive/brown person. Waiting VERY impatiently to see it in a new post. I may be a blue/gray kind of person, after all!!! Kristi…did you try “kitty litter” to soak up the oil stains? It works well on garage floor oil stains, maybe it’s worth a try. I haven’t tried it yet. If the stain remover I bought at Home Depot doesn’t work, I’ll try that or some of the other things I’ve read about, like diatomaceous earth. Someone below also mentioned Oxyclean. I keep peroxide in a squirt bottle, and if you haven’t tried it yet for the stains, it may work. Also put baking soda on the oil stain, then add vinegar or lemon juice and let that cook, then dawn dish soap, then peroxide. Let them each set for awhile. Love the new color you picked! Grass cloth is wow! I’m thinking of making my kitchen counters like your bathroom! I know sealing will be key to keeping them good. Did get my Kreg jig and love it! I believe I might have missed what color the top cabinets will be,or are they staying green? Love your work,and share your frustrations with home fixing. It took me five months to get my bamboo floors completed this spring summer with a big box company and their installers. Love to follow all your progress! 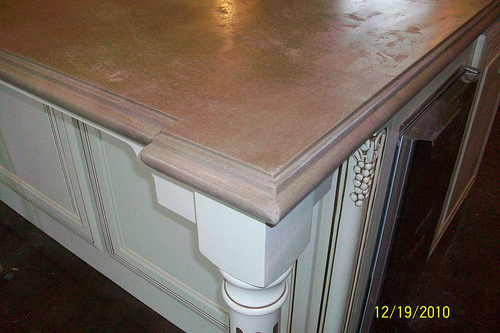 Have you thought about using epoxy counter tops? I did look into that. The one thing I don’t like about epoxy countertops is how shiny they are. I have yet to see epoxy countertops that aren’t a high gloss. Update posts like this are so helpful for those of use who work on our own homes. It’s helpful to know what works but even MORE helpful to know what didn’t work, why, specifically, it didn’t work, and what you would do differently. Thank you so much for this! Just wanted to pass on something I either heard or read recently. They were talking concrete and repairing concrete. They said to make sure that in repairing it with a skim coat type product to make sure this product says it adheres to the original concrete so it forms a bond. Good luck. I love all your work and you make me feel I could do some things myself which I plan to do in the winter months in Ohio. A bonding agent is also available to use in conjunction with overlay products. I am really keen to know about hanging the grasscloth wallpaper. I have had rolls of it for months now and am not too sure how to go about it and if a special adhesive is necessary? I’ve been watching YouTube videos on hanging grasscloth to get some pointers. One said specifically that he uses “heavy duty vinyl” adhesive, so I bought some at Sherwin Williams that was labeled “high tack” vinyl adhesive. Hopefully that will work out. I might have a solution for your oil stains on t he countertop! I have done this, and it even pulled red wine out without a trace. Try making a poltice with oxiclean white revive and water. Smear it on the stained area and leave it alone until it dries completely for about a day, then vacuum up the dust. It literally absorbs up the stain. It worked for me- I hope you’ll give it a try. Great idea! I bought something from Home Depot that seems to work the same way. It’s a liquid that you put on the stain, and it turns white as it dries. Then you brush or scrape it off, and it comes off as a powder. If this stuff doesn’t work, I’ll give the Oxyclean a try. I’ve also heard that cat litter will work, but you have to grind it up into a finer powder first. And diotomaceous earth will also work. Basically anything that will draw the stain up and out of the concrete like that will work, or they’re supposed to, at least. 🙂 I’ve yet to try any of them, though. I just assumed it was the clumping kind, but it doesn’t say specifically. Hi Kristi! In regards to pulling out the stains, is there any prep work before you try the different cleaners? I didn’t do any prep work before trying the cleaners. Sounds great; looking forward to the updates on all your renovations you mentioned. 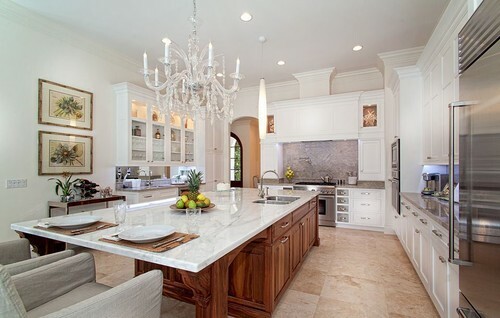 I love the look of marble too but do you realize how badly it stains also? I have a marble vanity and I have to put little trays under the soap dispenser and even under the water glass because the drips soak in and stain the marble. They are absolutely not low maintenance. I bought a sealer for them as soon as I noticed the stains but don’t want to seal in those stains. I am hoping to find something that will clean them before sealing. Yes, I know it’s not practical at all, and etches badly. I probably wouldn’t get the real thing. I’d go with a quartz product or something like that that’s made to look like marble with the veining. I’ve seen some that look almost identical to marble. Which hallway is getting drywalled? The hallway between the music room, the hallway bathroom, our bedroom, Matt’s game room, and my office. Cannot believe how awful your concrete got. That is a shame, all that work. Hopefully your fix will at least make it bearable. That other blog that you refered to looks amazing. I just looked at the picture you posted. What a difference from one to the other. Did they have a professional do it, or did they do it themselves? How did they get them so white and with the subtle gloss to them. If I were in your shoes I would be reading everything they had to say about it to try to get something similar. Sometimes it is just easier to go with the expensive “want” and maybe back off on some other project for a while to readdress the finicial status. I love the marble and if I had it to do again I think I would choose marble certainly for bathrooms, and maybe for some areas of the kitchen. OR…could that potentially damage the concrete surface? 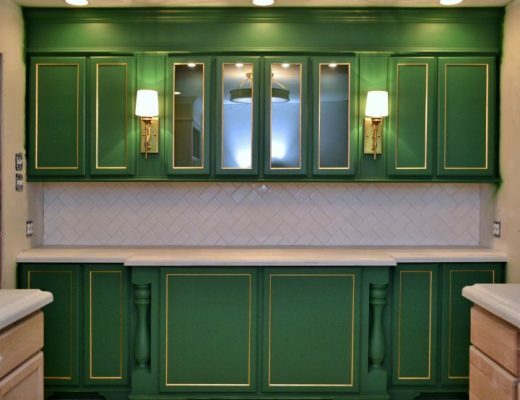 Having been a decorative painter for many years, I cannot tell you how difficult it is to mimic the look of marble, especially on a counter top where it is at eye level (on flooring, you have a bit more visual space). The veining and softening (even using a spray bottle to mottle the veining and cloudiness) is just very, very difficult. That being said, I just installed Zodiac’s London Sky quartz in my kitchen and laundry room. It is beautiful. 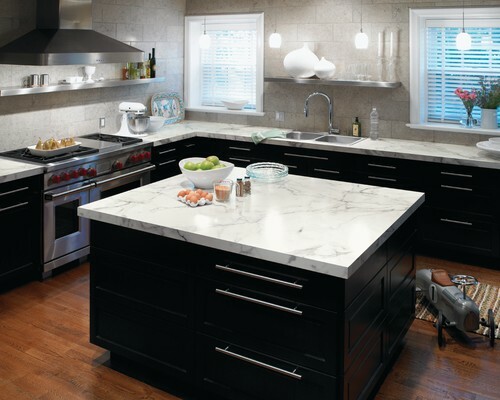 It best copies the appearance of Carrara marble without the worries of marble’s porosity. I would highly recommend it. Obviously these materials have two completely different price points. So someday when your budget allows splurge for the London Sky. Krisiti, I have granite so when I hear countertops I think $$$. Would you mind sharing the cost of concrete countertops DIY ? Quick question……do you still have the yellow paint samples painted on the front of your house? 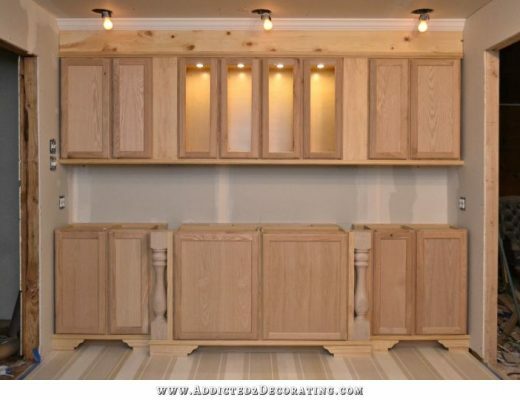 I have a question on a totally unrelated note, although I am anxious to see how your countertops turn out, as you inspired me to attempt them for my outdoor kitchen. I purchased the Critter paint sprayer that you used on your cabinets, and I have had a difficult time getting it to work correctly. I read a blog post about how to adjust pressure, viscosity, and spray tip, but my sprayer seems to clog in the middle of a painting project, and I have to stop and fiddle (technical term) with it to get it working again. Do you have any other pointers? I used Floetrol, and even added water to thin paint even more, still get clogging. The only time I ever have that happen is when I forget to strain my paint before putting it into the jar. I’ve never had that problem when I strain the paint as I pour it into the jar. I get my paper strainers (single use) from Home Depot or any local paint store. I was thinking of using the stonelok e3 2k sealer as well, with the same edge you have. Did you apply it with a brush on the profile of the counter and with a roller on the rest? How is the sealer holding up?